So from New York to Argentina, first stop... Buenos Aires. After having checked out of the hotel in New York 48 hours before we arrived, I was more tha happy to be in BA (note to self, New York to Buenos Aries via London is not the most direct route. 11 hour stopover in London is also not ideal, however pies from Jumbucks in Shepherds Bush was a small band-aid on the wound). Met up with Jules and Na at the hostel (have not seen Jules since March, very exciting!) and was immediately presented with beer. Our room took a while to get ready but thankfully the Milhouse Hostel where we were staying has a fully licensed bar top help pass the time. Went to an AMAZING steak restaurant that night too, La Cabrera. If anyone is ever in BA, go! It was possibly some of the best steak I´ve ever had. So the first day in BA was mostly beer and steak... definitely a sign of things to come. General impression of Buenos Aires, it´s a big, crazy, dirty (in parts), rich (in parts), lively city with some of the best steak I´ve ever eaten in my life. You have dinner at midnight, clubs don´t get going until 2am, people try and sell anything from socks to stickers to joke books on the underground, the rich bury their dead in mausoleums in Recoleta cemetary - a village for the dead, you can get a huge pizza for 10pesos (5 aussie dollars) at 5am in the morning, people will charge you for anything and everything and you can get steak in every restuaurant you go to. And I love it! Couple of highlights from BA - NYE party at the hostel then Crobar club, we left for the club at 2.30am and danced the night away, yet I was still surprised to find it was sunny when we left. 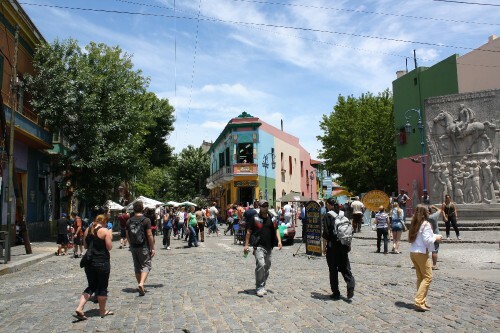 Trip out to La Boca. It´s the old ghetto (and still is a bit) but they´ve painted it in bright colours and thrown in a lot of cafes and markets so it´s fun day out. Bit of a tourist trap but still fun to see. Marekts at San Telmo on Sunday were also cool, as was sitting down at the Plaza right at the centre of it all for beer, peanuts and people watching.